Visibility dropped to zero in parts of eastern Washington on October 4, 2009, as a large dust storm blew through. 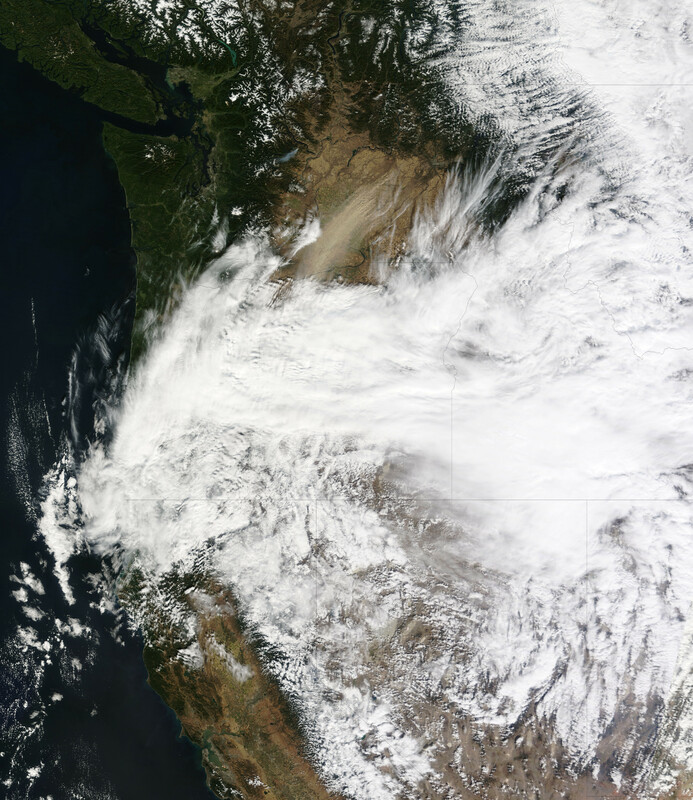 This image of the storm was captured by the Moderate Resolution Imaging Spectroradiometer (MODIS) on NASA’s Terra satellite shortly after noon (Pacific Daylight Time). According to local news, the storm brought strong winds gusting to 43 miles per hour in places that propelled the dust across the southeast corner of the state. After numerous multi-vehicle accidents, sections of Interstate 90 near the town of Moses Lake and several local roads had to be closed for several hours. A thick, rippling plume of dust runs northeast to southwest through the center of the image. 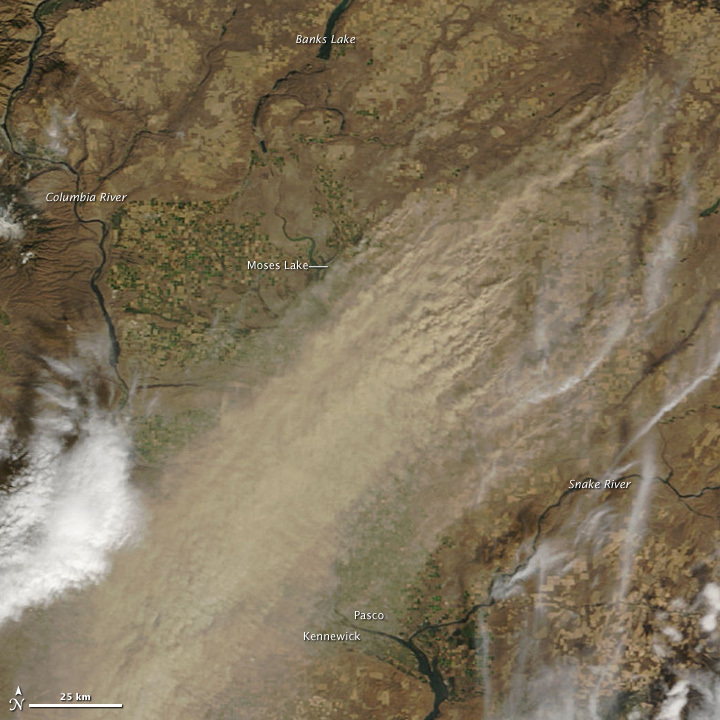 Dust stretches as far south as the cities of Pasco and Kennewick, which sit on opposite banks of the Columbia River. In the north, the dust seems to rise primarily from the pale golden squares of fields farmed using dryland agriculture, a common practice in arid eastern Washington. The dryland fields are larger and less colorful than the bright green and gold fields of irrigated agriculture near the Columbia and Snake Rivers in the center of the image. Dryland farmers rely entirely on rainfall to sustain their crops, and as a result, do many things to preserve moisture in the soil. Some of these practices—leaving a field fallow after harvest to allow water to build in the soil for a year or covering the field with dry soil to prevent underlying moisture from evaporating—make dryland agriculture very prone to dust storms. These fields are likely either fallow or newly planted, probably with winter wheat, a common dryland crop in eastern Washington. The dust storm persisted for several hours and was still visible when Aqua MODIS flew over the region at 2:00 p.m. local time. The Terra MODIS image shown here is available in multiple resolutions from the MODIS Rapid Response System. NASA image courtesy Jeff Schmaltz, MODIS Rapid Response Team. Caption by Rebecca Lindsey and Holli Riebeek. 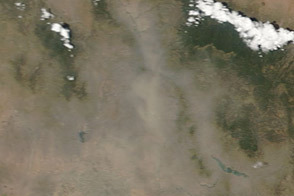 A thick, rippling plume of dust runs northeast to southwest through the center of this image of eastern Washington state on October 4, 2009. Horton, P. (2009, October 4). Weather: Blowing dust shuts down part of I-90, record rain falls in Kennewick. Tricity Herald. Accessed October 5, 2009.